The U.S. Water Alliance has announced Emory University as one of three winners of the prestigious 2016 U.S. Water Prize. The award recognizes organizations and companies that execute innovative solutions toward the advancement of "one water" sustainability, meaning strategies integrated across the water cycle and within urban management overall. Emory is recognized for its WaterHub project, an on-site water reclamation system that opened last spring. The system, which utilizes eco-engineering processes to clean waste water for future non-potable uses, is capable of displacing up to 146 million gallons of potable water with recycled wastewater annually, nearly 40 percent of total campus water demand. The WaterHub generates an alternative water supply for critical heating and cooling operations while offering numerous economic, environmental and social benefits to both the University and broader community. 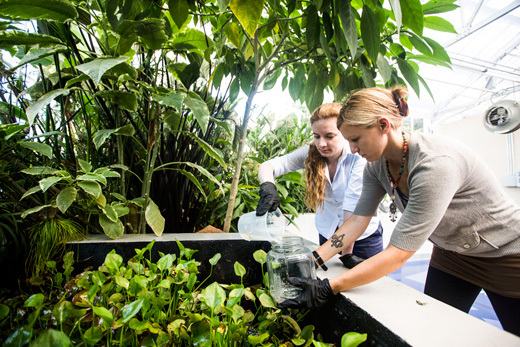 "We are gratified for this recognition from the U.S .Water Alliance for the WaterHub at Emory. Through this project, we've shown how universities can play an important role in advancing sustainability nationwide," says Matthew Early, vice president for campus services at Emory. "Not only has the WaterHub had tremendous impact on how we think about water and how it is utilized on campus, it has also become a national model for those seeking innovative technology to address the global need for water conservation and sustainable solutions." The WaterHub was completed through a design-build approach between Sustainable Water, project consultant; McKim & Creed, engineer; and Reeves Young, contractor. With the WaterHub’s superior approach to water management, Sustainable Water and McKim & Creed nominated Emory University for the U.S. Water Prize. "McKim & Creed is incredibly proud to be a part of such a phenomenal and unique project as the WaterHub at Emory," says Tim Baldwin, McKim & Creed senior vice president. "Emory University has set a very high standard for water conservation that is being recognized and honored throughout the country." Jonathan Lanciani, president and CEO of Sustainable Water, agrees. “The dedication of the WaterHub allows Emory to significantly reduce its demand on the regional water resources," he says. "Taking wastewater and turning it into high purity reclaimed water with a natural process effective today has been achieved." U.S. Water Alliance CEO Radhika Fox called the three winning institutions "true visionaries in the one water movement." "While the challenges facing the water sector are great, our capacity of innovation and positive solutions is greater," Fox said in announcing the awards. "That's why the U.S. Water Alliance created the U.S. Water Prize — the first of its kind recognition program that celebrates outstanding achievement in driving towards a sustainable water future." Jim Clark, senior vice president at Black & Veatch and chair of the U.S. Water Alliance's recognition committee, which selects the U.S. Water Prize winners, noted that the three winners "are nothing short of incredible" and praised Emory for "showing us what is possible when major anchor institutions like universities invest in water reuse." Other winners of the 2016 U.S. Water Prize include DC Water for its Walter F. Bailey Bioenergy Facility and Dow for its Minimal Liquid Discharge technology. Emory University will join Dow and DC Water at the award ceremony during the One Water Summit June 8 in Atlanta, hosted by the U.S. Water Alliance. Magazines such as District Energy, Industrial WaterWorld, CE News and Sustainable Business Magazine have published articles highlighting the WaterHub for its design as a replicable, sustainable wastewater management solution.